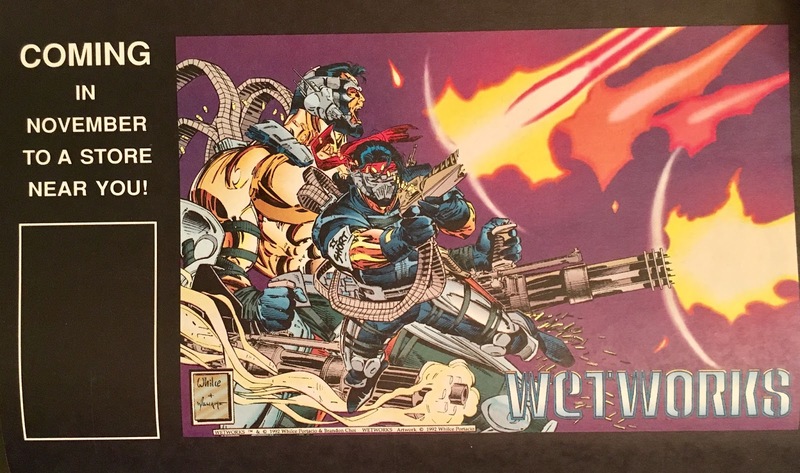 Before we got all Christmassy, we dipped our toes into the WildWorld of WildStorm... today we're going to return there to discuss the very first WildStorm book... that even predates the imprint itself! 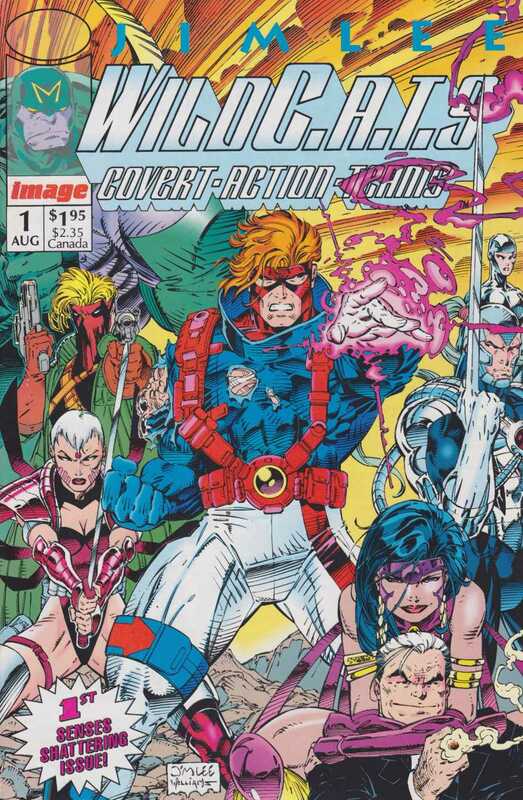 WildC.A.T.S #1 was part of Jim Lee's Image Comics "fiefdom", however... that fiefdom was called Homage Studios! Soooo, maybe we're covering this one on a technicality... but, ehh... whattayagonnado, right? 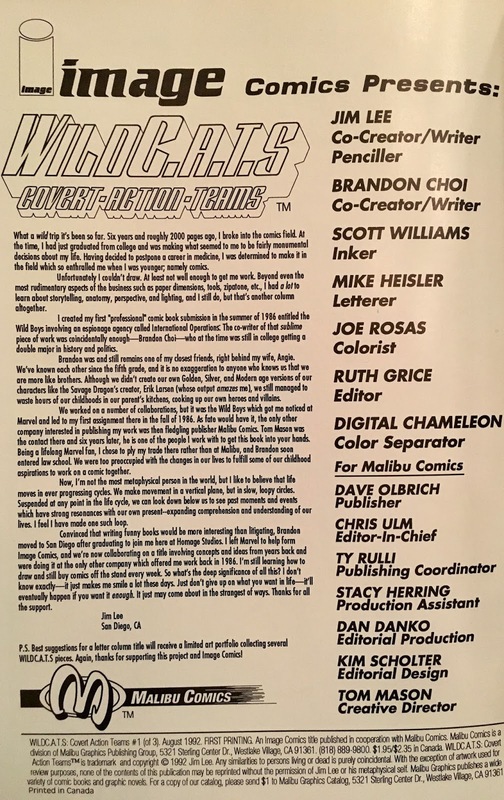 This is where the WildStorm "lore" begins... er, began... er, whatever... so let's just get to it. We open in "the past"... 1980. Two Antarctic researchers are hoofing it through a snowstorm to follow up on a spike in their sensor readings. What they come across is a metallic sphere... which starts to glow. In a glow of pink light, a metallic and angelic woman appears with a warning... she needs the sphere... before it's too late. We then hop to "the future"... 1992. There has been an explosion in Georgetown... neighborhoods have been vaporized! One of the bodies was identified as a dwarf by the name of Jacob Mar--. The same metallic woman arrives, but only for an instant before blinking out of sight. Next up, "the present"... 1990. Here we meet Jacob Marlowe, a diminutive homeless man, who is sleeping among the refuse of the city... including a flyer for Rob Liefeld's Extreme Studios, and a box of X-Men (vol.2) #1's (the Magneto cover variant). He is awakened by a pair of sad looking gangbangers, who rough him up a bit... before our metallic friend, who we learn is called Void, arrives to pull his fat out of the fire. She informs him that he is in actuality one of the Lords of Power... and his real name is Lord Emp. We now move to "today"... which means we're somehow back in 1992. Marlowe again wakes up in an alley... but this time it's due to drunkenness, not homelessness. He stumbles out of the refuse and after getting hit by a cab, walks into his high-rise office building. On the elevator ride up, his attendants clean him up a bit, and inform him that the company stock is on the rise. In his penthouse office, he meets Void who tells him about a recurring nightmare she's been having. 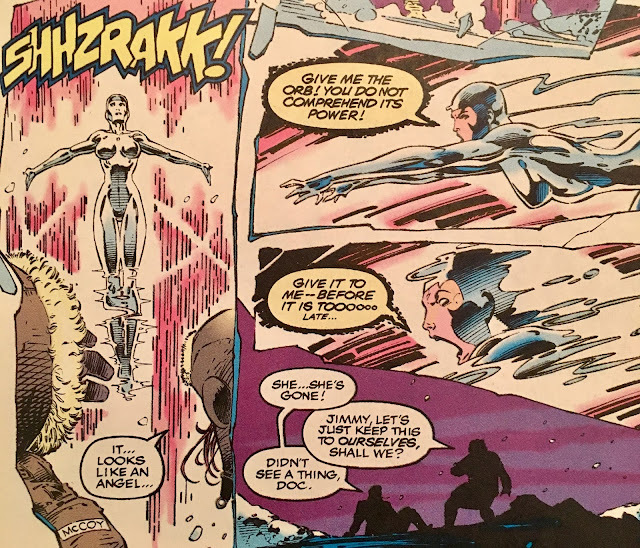 She is in combat with a masked man who wields the glowing Antarctic orb. Somehow this affects the fabric of time and reality. 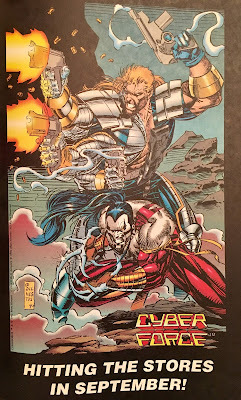 The pair take a special elevator to the Danger Room Combat Training Room, where WildC.A.T.S team-leader Spartan is training with Maul and Warblade. 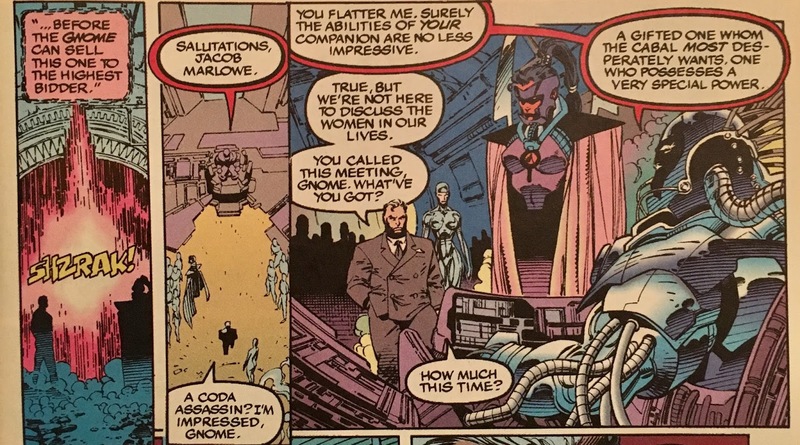 We learn that they are training for a battle with "the Cabal"... and due to a goof-up in their drills, a disappointed Marlowe wonders aloud if he might be able to "afford a Youngblood or two". Psst, hey Marlowe... check the quarter-bins! After their traitor is dealt with, 'Spont turns his attention toward a woman called Providence (oy). She warns that "the one he seeks" is close... which perfectly segues into our next Marlowe bit, where he meets with a character called "Gnome" about, well... the same exact thing. This brings us to Georgetown, where we meet Cole Cash. He bellies up to the bar, and it seems like he's old pals with the bartender. He watches as the "night's entertainment" commences. On stage there is a beautiful dancer only known as Voodoo (hey, we know her!). 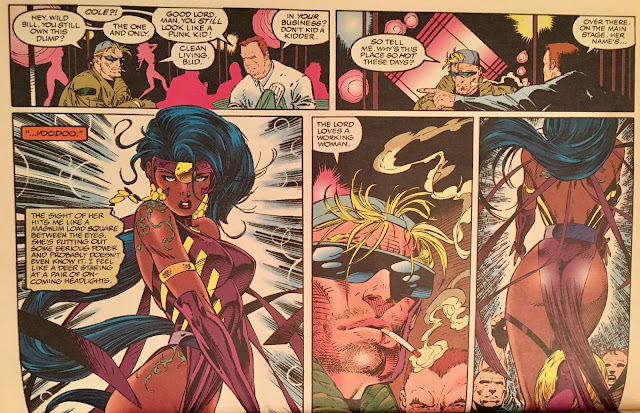 Cash lights up a smoke, and we can see that he's not the only person paying attention to the dancer. A blonde man in sunglasses approaches the stage... and we pop into Voodoo-vision. It seems as though she has the power to see things, well, differently than others. It's as though she's always wearing Roddy Piper's sunglasses in They Live... because she sees the blonde fella as a horrifying monster. Just as "business" picks up, Cash rolls down his bandanna revealing himself to be the guy we all know as Grifter! In a humorous panel, he is mistaken for Shaft (Hey, watchure mou-- nonono, the one from Youngblood). He keeps mentioning a "Sister Zealot"... but, we'll get to her. 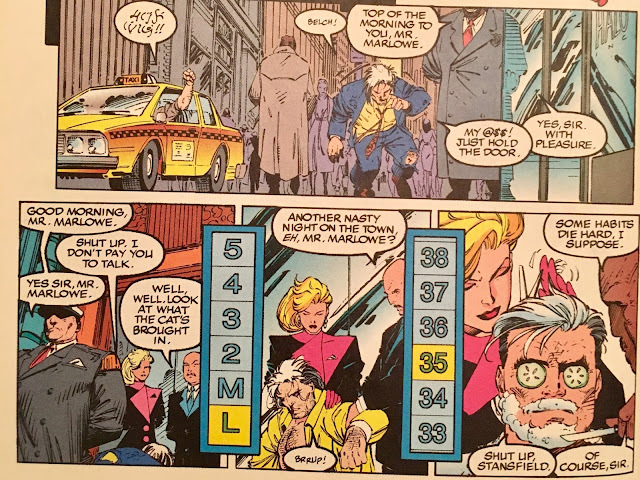 We get a brief peek at Marlowe's office, where the WildC.A.T.S are... well, watching the news report about the goings-down in Georgetown. That's really about it. Spartan suggests they head in... Marlowe needs some time to think. Okay... Anyhoo, back at the bar, Grifter has snagged Voodoo and is protecting her from the Cabal horde... which is led by a woman he says is of "the Coda". He fires a "load" from his "magnum" into her gut... which, well... it slows her down. Thankfully, the C.A.T.S have arrived on the scene... but the only thing they accomplish is getting a gun jammed up to Marlowe's head. Good job guys! 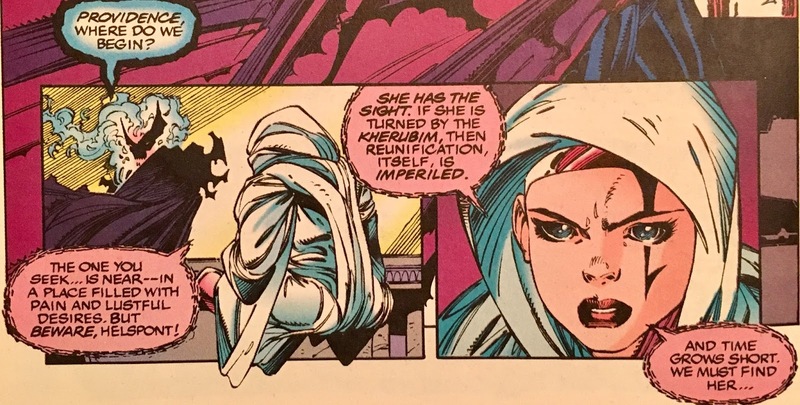 Thankfully (again), this is when "sister" Zealot chooses to make her appearance. I could'a sworn she had long hair... guess I misremembered that... anyhoo, she greets her "brother Grifter" and nails Marlowe's would-be abductor with a chakram... boomerang thing. With the threat neutralized, the group gets cozy. 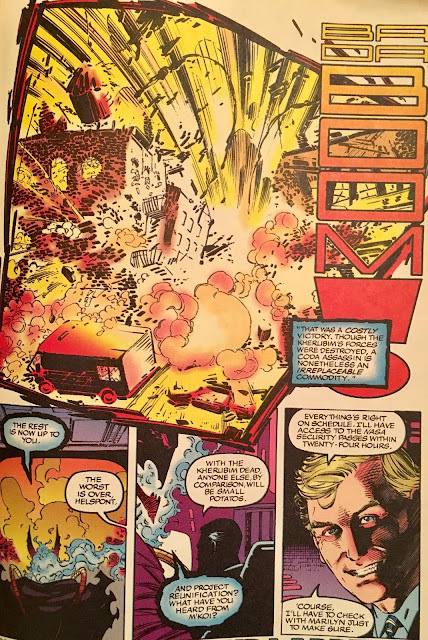 This gives that Coda woman the opportunity to activate a detonator which... blows up Georgetown... which, er... is that from the opening pages of the book... or is it blowing up again? 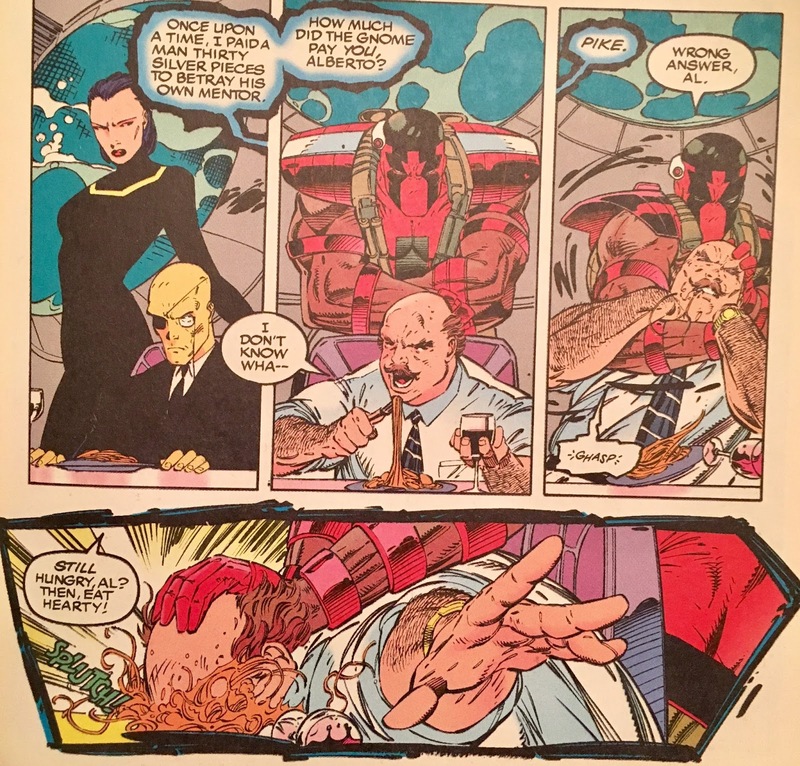 Well, nevermind all of that... before we wrap up, we see Helspont talking to his benefactor... Dan Quayle? And, wouldja lookit that... he misspells "potatoes" as "potatos"... wonk wonk wonkkkkk. Really, Jim... this is how you end your first issue? 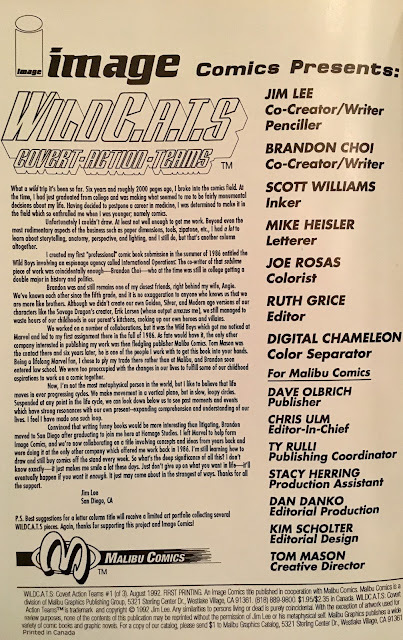 Reading it today, I couldn't imagine that I would've been all that compelled to come back for issue #2... but, back in 1992... I did! WildC.A.T.S was the Image Comics title I decided to "stick" with. 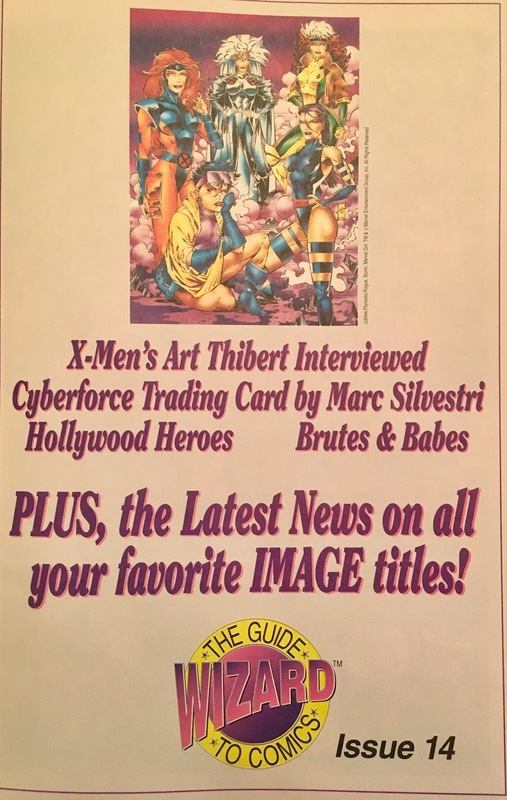 This is very likely due to Jim Lee's art, which was part of the package when I got hooked on the X-Men. 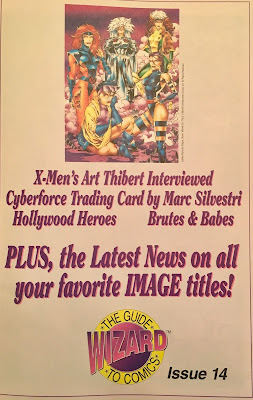 I think, based on art alone, my friends and I saw this as something of a spiritual successor to the X-Men... or at least the Image book most like the X-Men. Thinking about that now... it's fairly ridiculous. I'd forgotten just how "universe buildy" these early Image books were. 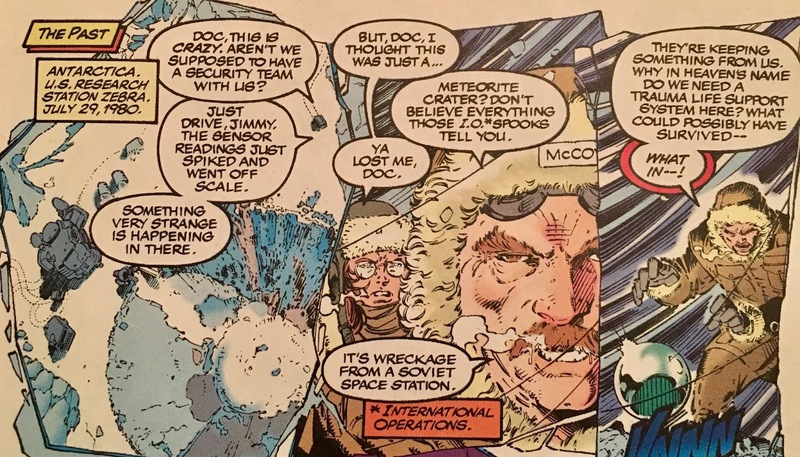 We get several mentions of Youngblood and Cyberforce stuffs... we see the news reporter from Spawn... just so strange, considering how all the founders kind of splintered their universes into their own things. Asamattafact, I was reading the first few issues of Spawn earlier today... and there are some other-Image-y name drops there as well! Such a weird time in comics. Now, for the issue itself... like I said, it was decent enough. We get a bit of an info and character dump... but it flows quite well (minus the how-many-times-did-Georgetown-blow-up? thing). We don't have much of a reason to care about these folks yet... or any real reason to hate Helspont... other than the fact that he's clearly the villain. 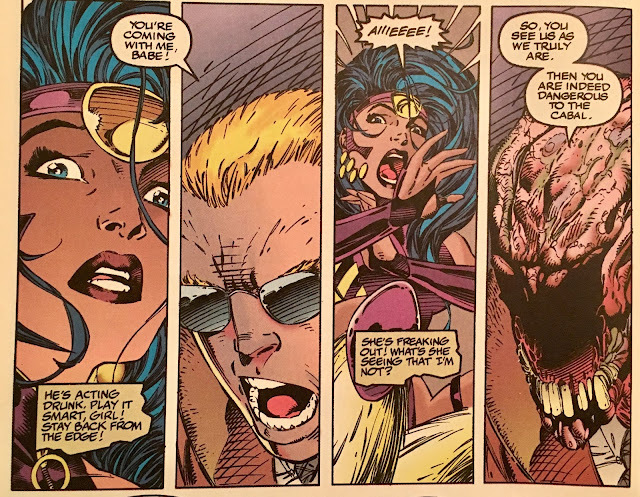 Grifter and Zealot are definitely primed to be the breakout stars here... and that's fine... they're really the only characters (outside of Marlow) that get the most screen time... and they're the ones that get to do the cool actiony stuff. Can't say all that much about the story... because not all that much happened just yet. We get some nebulous warning about timelines converging and what-not... we learn that Marlow is really a Lord of Power called Emp... not too much to go on. Nothing wrong with it... but not much to go on, and to be honest... it's been at least 15 years since I last read these books, and I couldn't tell ya how any of it shakes out. I will say that the ending here... with Dan Quayle... lame. Layyyyyyme. Now the art... it's Jim Lee, so yeah... it's preeeeeetty damn good. Okay, it's really damn good. I will say, and I do not mean for this to sound creepy... but the crotches are just line-filled shapeless masses... just check out the cover. The character designs overall are quite nice. When compared to something like Youngblood... this looks positively inspired. 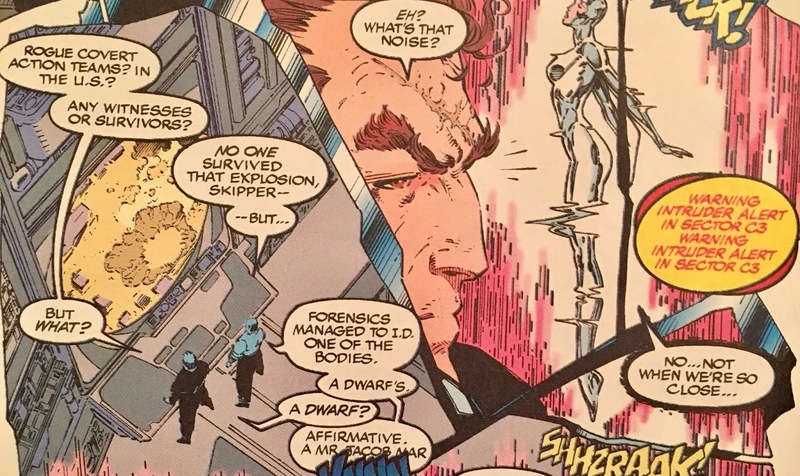 There is no "Wolverine with elf-ears" here, nor is there a "long-haired Cable". These characters all look original... though with some borrowed styles of the day. I'm not sure who thought that weird head-stocking was ever a good idea... but the early 1990's were full of 'em. 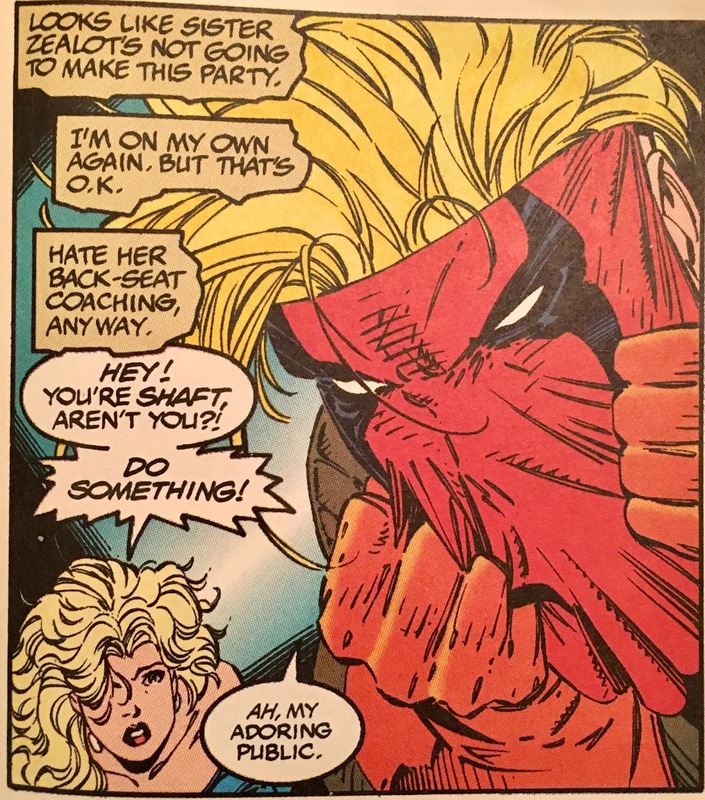 The breakout character design has gotta be Grifter. It's a look that, to me, became almost instantly iconic. It's really one of the coolest designs to come out of the 1990's. It's instantly recognizable, and doesn't look like anything I'd ever seen before. He was, to my small clique... the "Wolverine" of the team. Overall... this is a tough one to give a "for" or "against" toward. It's interesting in that "Image opening salvo" kinda way... but, it's doubtful that any of these stories still matter anymore. The art is great, and the story is... fine. If you're down for some early 90's action, you could do far worse. 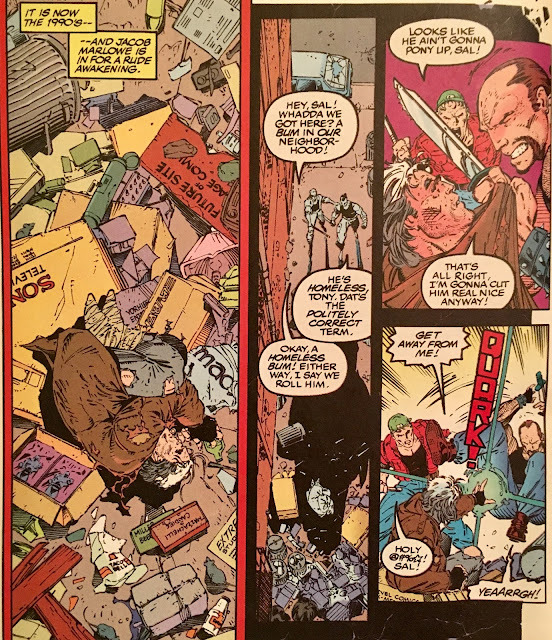 This was indeed an interesting, yet weird time in comics. 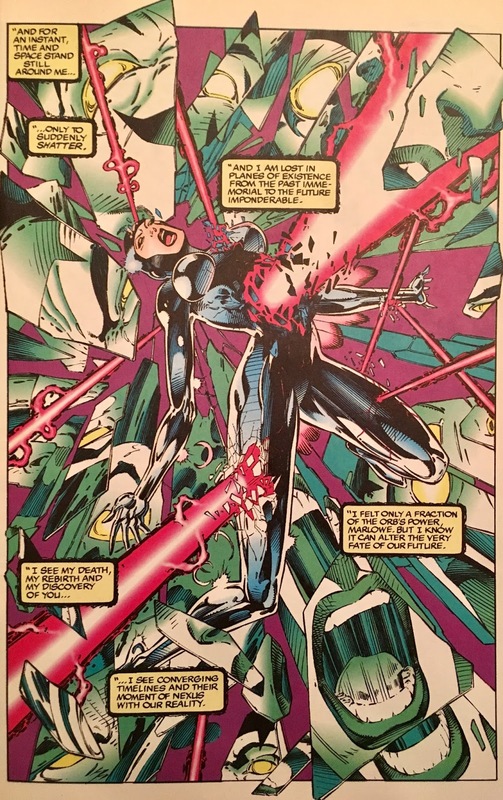 I bought this issue for the art alone. The animated series was dreadful. While I had high hopes for Pitt and Wetworks, those were quickly dashed due to their inability to make their deadlines. 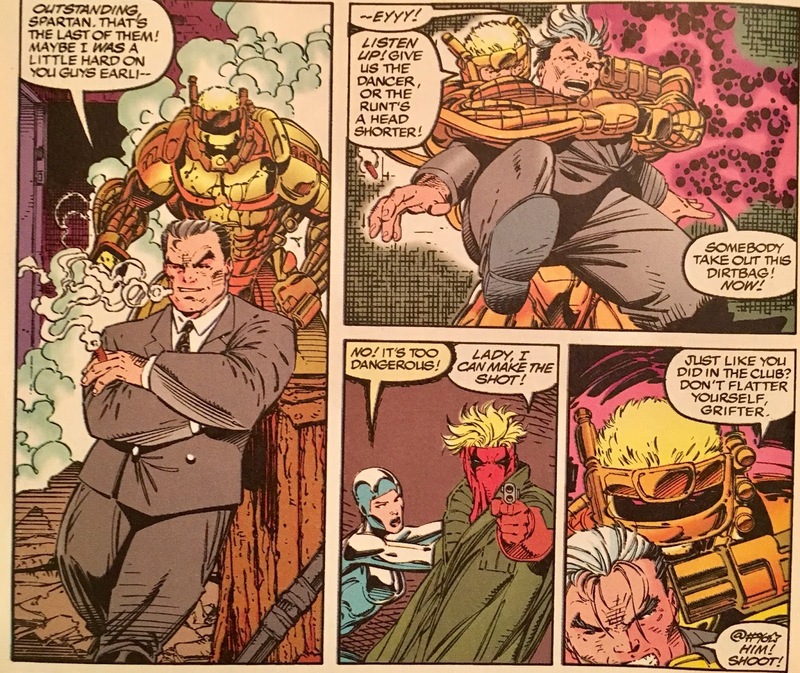 Oddly enough, my two favorites from this era of Image was Cyber-Force and The Maxx. The latter was probably my favorite during this time period due to its visually jarring and quirky artwork style. Great review!